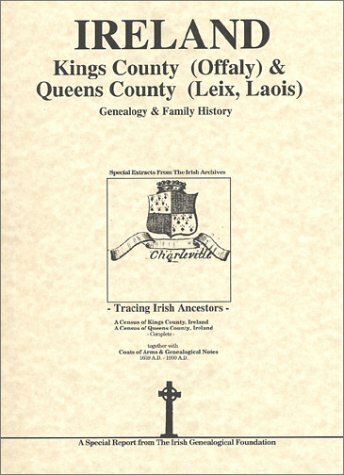 The family research guide with real life extracts, including maps, 40 illustrations, family history extracts and coats of arms, a 17th century census as available, and more for Kings County (Offaly) and Queens County (Leix - Laois) in Ireland. A boon to genealogy research and organization in Kings and Queens Counties, neatly bound so that pages easily lay flat. From the archives of the Irish Genealogical Foundation. Part of the 32 county set on Irish Families.